Was Saint John the Baptist an Essene? Comments Off on Was Saint John the Baptist an Essene? Was John the Baptist the cousin of Jesus of Nazareth? John the Baptist was the son of Zachary, a priest of the Temple in Jerusalem, and Elizabeth, a kinswoman of Mary who visited her. He was probably born at Ain-Karim southwest of Jerusalem after the Angel Gabriel had told Zachary that his wife would bear a child even though she was an old woman. He lived as a hermit in the desert of Judea until about A.D. 27. When he was thirty, he began to preach on the banks of the Jordan against the evils of the times and called men to penance and baptism "for the Kingdom of Heaven is close at hand". "Knight of the East and West" St. John the Baptist was likely a member of the Essene sect as he followed their ascetic doctrine. Pike further says that his teachings like those of the Essenes were truths gathered from India, Persia and elsewhere from the east as well as from Pythagoras and other Greek thinkers. Thus Masons carry on with these truths taught by John the Baptist, The Essenes and others now gone. "... and the old faiths have faded into oblivion. But Masonry still survives, vigorous and strong, as when philosophy was taught in the schools of Alexandria and under the Portico; teaching the same old truths as the Essenes taught by the shores of the Dead Sea, and as John the Baptist preached in the Desert; truths imperishable as the Deity, and undeniable as Light. Those truths were gathered by the Essenes from the doctrines of the Orient and the Occident, from the Zend-Avesta and the Vedas, from Plato and Pythagoras, from India, Persia, Phoenicia, and Syria, from Greece and Egypt, and from the Holy Books fo the Jews. Hence we are called Knights of the East and West, because their doctirnes came from both."
. Szekely obtained access to Aramaic documents in the Vatican archives in Rome, and corroborated his translations with other ancient Greek and Hebrew documents (and confirmed by the writings later discovered in the Dead Sea Scrolls) surmised that both lived and studied at Qum Rum, that this is where Jesus "lost years" were spent, at the monastary of the Essenes by the Dead Sea where the scrolls were undoubtedly written, then sealed up and buried for eons. The finding of these long lost Essene documents have created a problem as they mirror the story of the passion play in the Gospels of the bible. They follow the ministry of one called only "Master" in the scrolls, but who also speaks the Sermon on the Mount and ends with the Master being crucified before Passover. Szekely states that the problem for the orthodox churches lies in carbon dating of these scrolls, which dates them 100-years prior to the crucifixion of Jesus Christ. At any rate Jesus and John were cousins. Mary mother of Jesus was the sister of Elizabeth mother of John, and Mary and Elizabeth have been tied to the Essene sect by scholars. That John and Jesus were preaching different doctrines is unlikely. In fact it was probably orchestrated, as the church of Rome teaches that John the Baptist was to lead the way for Christ. This is the account from Catholic.org: "He attracted large crowds, and when Christ came to him, John recognized Him as the Messiah and baptized Him, saying, "It is I who need baptism from You". When Christ left to preach in Galilee, John continued preaching in the Jordan valley. Fearful of his great power with the people, Herod Antipas, Tetrarch of Perea and Galilee, had him arrested and imprisoned at Machaerus Fortress on the Dead Sea when John denounced his adultrous and incestuous marriage with Herodias, wife of his half brother Philip. John was beheaded at the request of Salome, daughter of Herodias, who asked for his head at the instigation of her mother. John inspired many of his followers to follow Christ when he designated Him "the Lamb of God," among them Andrew and John, who came to know Christ through John's preaching. John is presented in the New Testament as the last of the Old Testament prophets and the precursor of the Messiah. His feast day is June 24th and the feast for his beheading is August 29th." What Did Albert Pike Say About the Press & Politicians? Comments Off on What Did Albert Pike Say About the Press & Politicians? "The Press is the great sower of falsehood. To slander a political antagonist, to misrepresent all that he says, and, if that be impossible, to invent for him what he does not say; to put in circulation whatever baseless calumnies against him are necessary to defeat him,---these are habits so common as to have ceased to excite notice or comment, much less surpise or disgust." "There are certainly great evils of civilization at this day, and many questions of humanity long adjourned and put off. The hideous aspect of pauperism, the debasement and vice in our cities, tell us by their eloquent silence or in inarticulate mutterings, that the rich and the powerful and the intellectual do not do theri duty by the poor..."
Comments Off on Is Freemasonry a Religion? This question has been asked of me by close to half of those who discover that I am a member of our ancient and honorable fraternity, including prospective applicants. The answer is of course no, freemasonry is not a religion, however it is too simplistic of an answer. To answer it in a more intelligent way I recently checked out Albert Pike's "Morals and Dogma" from the library at the San Diego Scottish Rite (thank you Bro. Norris), and will share what I gleaned from it here. Brother Pike consolidated and reworked the Masonic degrees following the blue lodge degrees in the mid 1800s. He is an unimpeachable source and this work contains his opinion on all things Masonic. I would dare not presume to interpret Pike, and find it unnecessary. The same is true of the ritual. If one does not understand the meaning then one should read it, or if possible, recite it again. There is a conciseness in the work rarely found in literature of any kind. Says Pike, "This is what is asked and answered in our catechism, in regard to the Lodge." 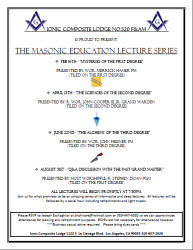 "A 'Lodge' is defined to be 'an assemblage of Freemasons, duly congregated, having the sacred writings, square, and compass, and a charter, or warrant of constitution, authorizing them to work.'" "Though Masonry neither usurps the place of, nor apes religion, prayer is an essential part of our ceremonies. It is the aspirations of the soul toward the Absolute and Infinite Intelligence, which is the One Supreme Deity, most feebly and misunderstandingly characterized as an "ARCHITECT." He continues, "Certain faculties of man are directed toward the Unknown--thought, meditation, prayer. The unknown is an ocean, of which conscience is the compass. Thought, meditaion, prayer, are the great mysterious pointings of the needle. It is a spiritual magnetism that thus connects the human soul with the Deity. These majestic irradiations of the soul pierce through the shadow toward the light." "It is but a shallow scoff to say that prayer is absurd, becouse it is not possible for us, by means of it, to persuade God to change His plans. He produces foreknown and foreintended effects, by the instrumentality of the forces of nature, all of which are His forces. Our own are part of these. Our free agency and our will are forces. We do not absurdly cease to make efforts to attain wealth or happiness, prolong life, and continue health, because we cannot by any effort change what is predestined. If the effort also is predestined, it is not the less of our effort, made of our free will. so, likewise, we pray. Will is a force. Thought is a force. Prayer is a force. Why should it not be of the law of God, that prayer, like Faith and Love, should have its effects? "Man is not to be comprehended as a starting point, or progress as a goal, without those two great forces, Faith and Love. Prayer is sublime. Orisons that beg and clamor are pitiful. To deny the efficacy of prayer, is to deny that of Faith, Love, and Effort. Yet the effects produced, when our hand, moved by our will, launches a pebble into the ocean, never cease; and every uttered word is registered for eternity upon the invisible air. "Every Lodge is a Temple, and as a whole, and in its details symbolic. The Universe itself supplied man with the model for the first temples reared to the Divinity. the arrangement of the Temple of Solomon, the symbolic ornaments, which formed its chief decorations, and the dress of the High-Priest, all had reference tothe order of the Universe, as then understood. The Temple contained many emblems of the seasons-the sun, the moon, the planets, the constellations Ursa Major and Minor, the zodiac, the elements, and the other parts of the world. it is the Master of this Lodge, of the Universe, Hermes, of whom Khurum is the represetnative, that is one of the lights of the Lodge. "For further instruction as to the symbolism of the heavenly bodies, and of the sacred numbers, and of the temple and its details, you must wait patiently until you advance in Masonry, in the mean time exercising your intellect in studying them for yourself. to study and seek to interpret correctly the symbols of the Universe, is the work of the sage and philosopher. It is to decipher the writing of God, and penetrate into His thoughts."